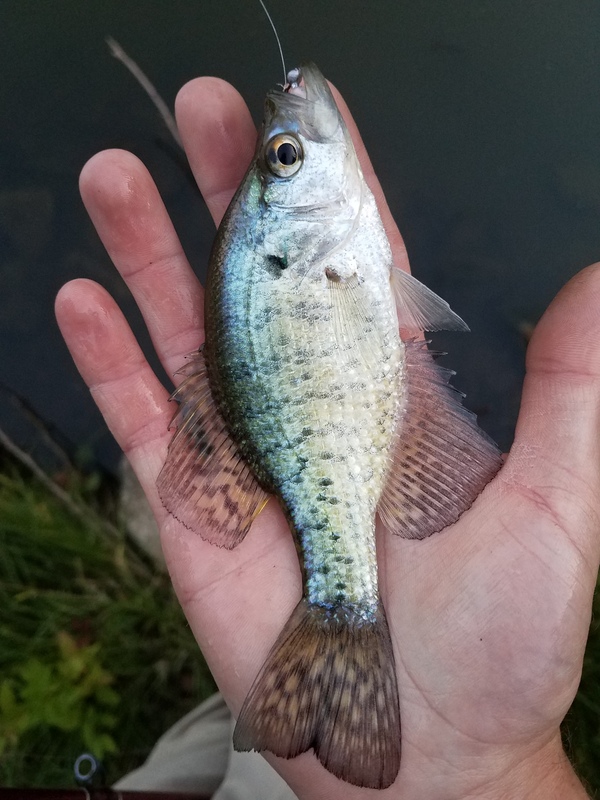 Late summer has always been one of my favorite times of year to go creek fishing, and this year has been no exception. 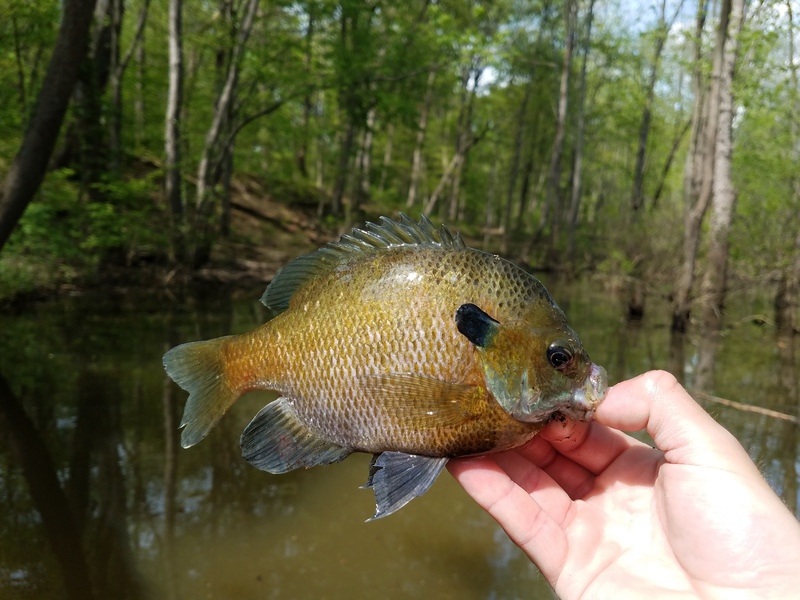 By this point in the year the water levels have dropped too far to be able to navigate in a kayak so bank fishing is the best option. 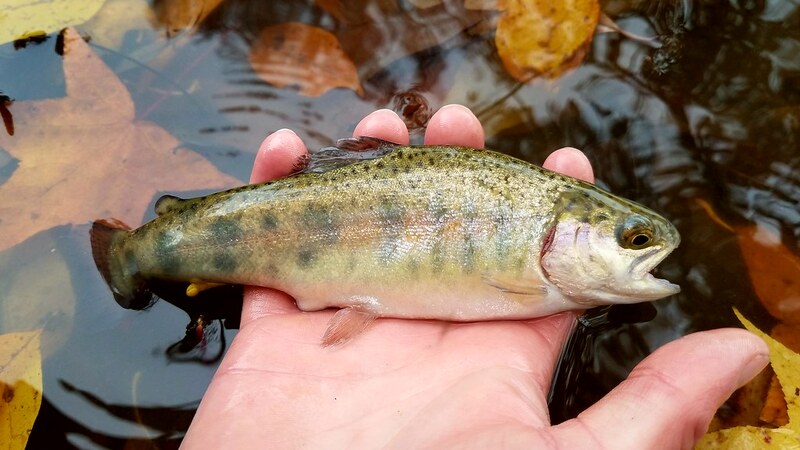 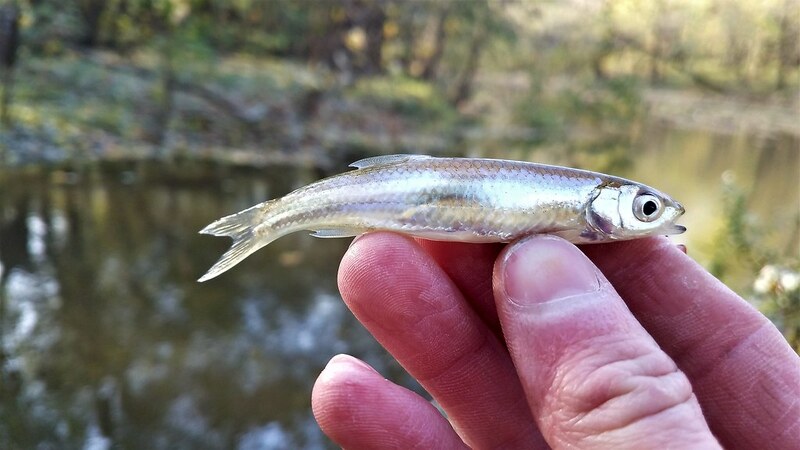 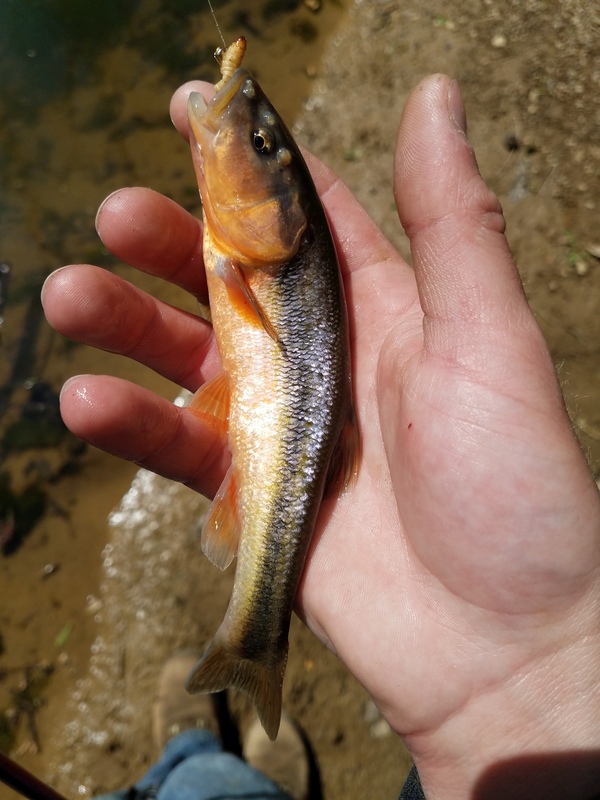 My favorite way to approach fishing a creek is to put bait on two rods and a lure on the other. 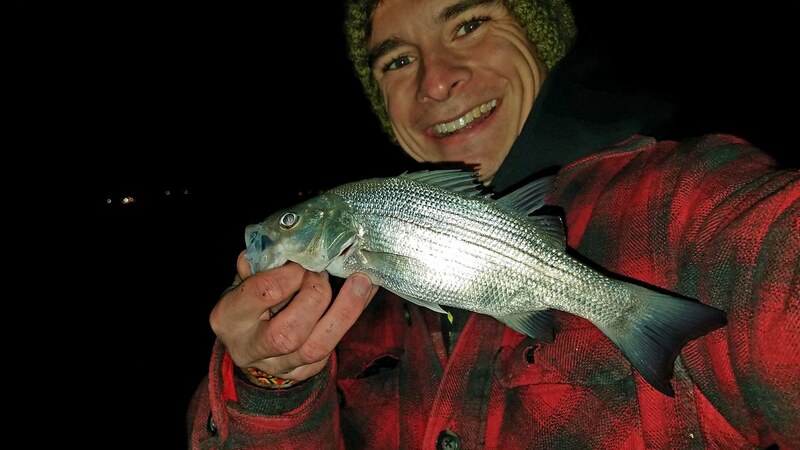 Not long after that I little Hybrid Striped Bass took the spinner. 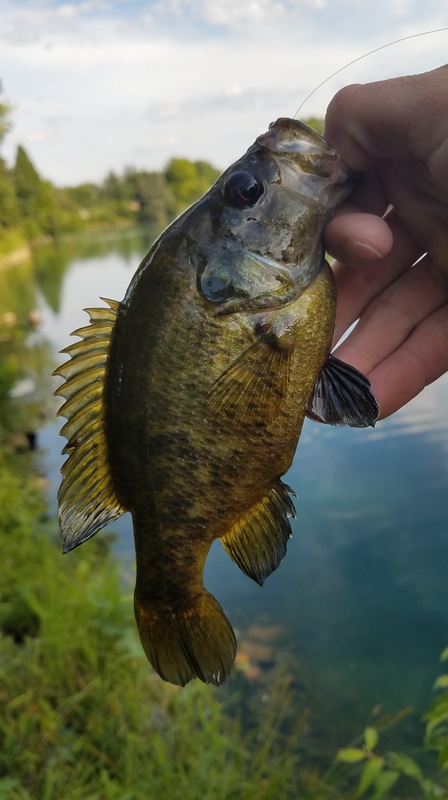 This one hit right on at the shade line from the trees. 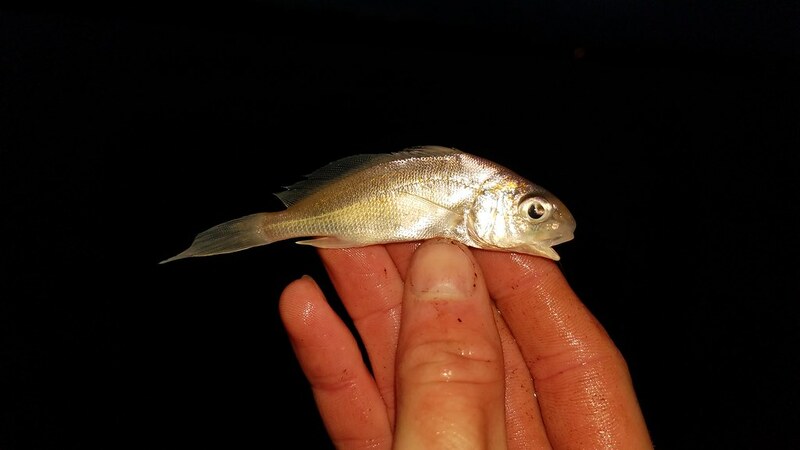 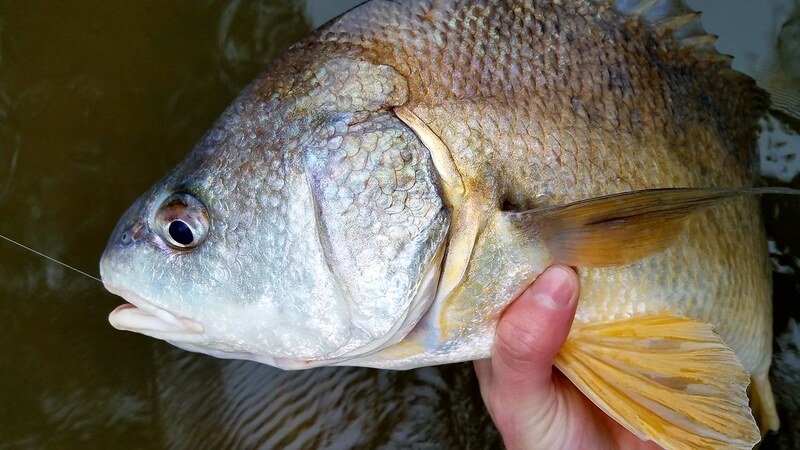 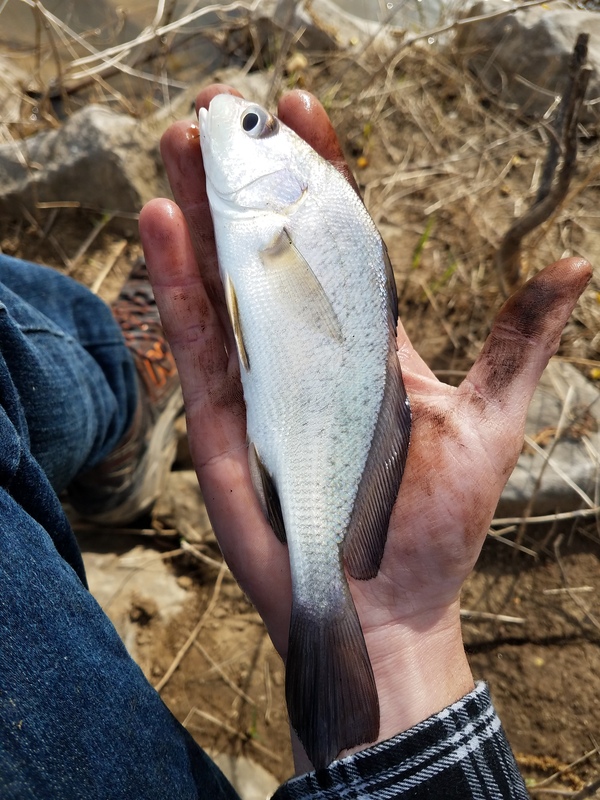 After that little fish the action slowed down, but I did managed to tempt a few Freshwater Drum with some nightcrawlers. 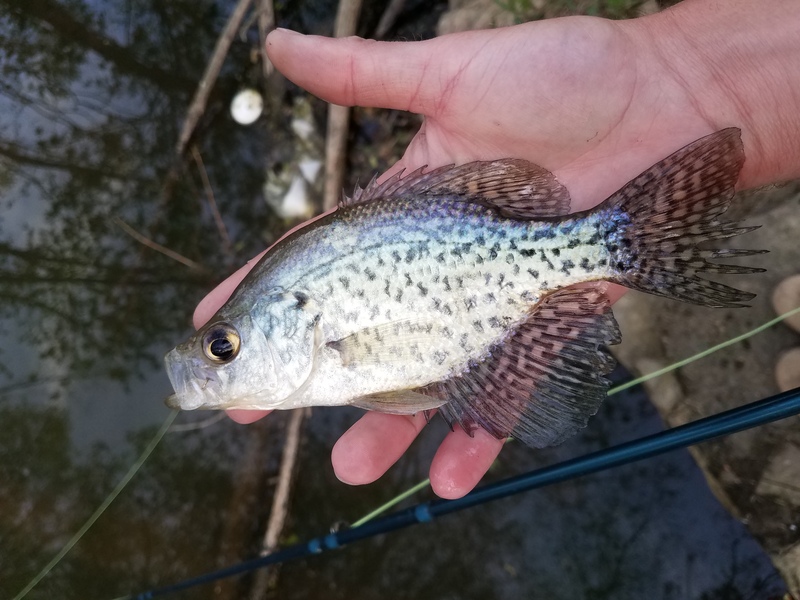 I switched spots to a bend in the creek after about a half hour with out a bite. 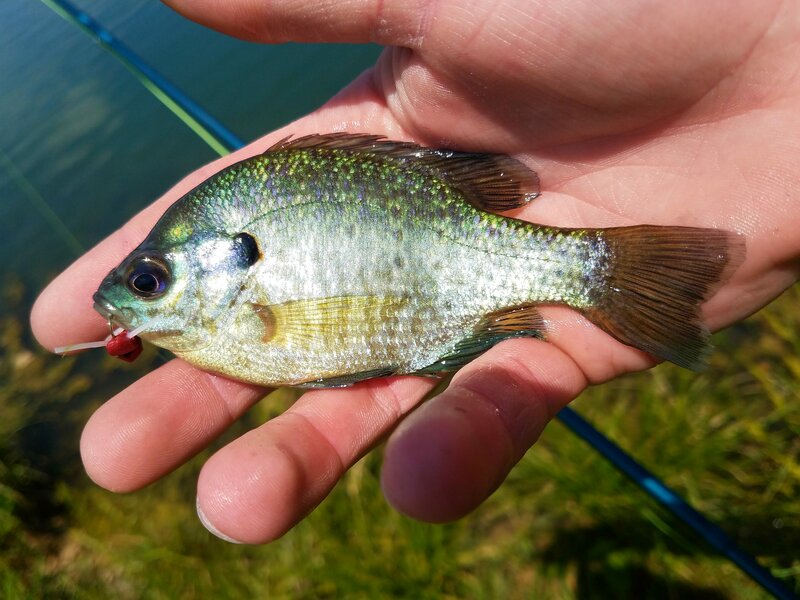 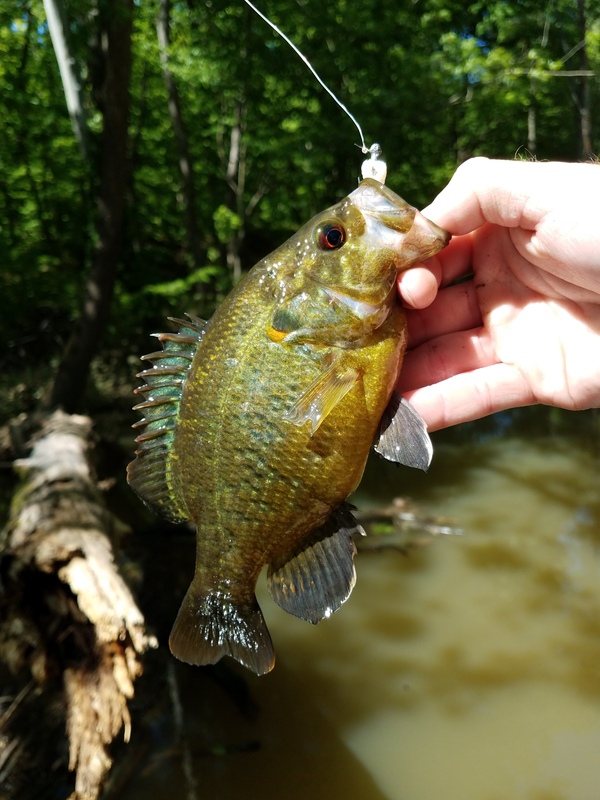 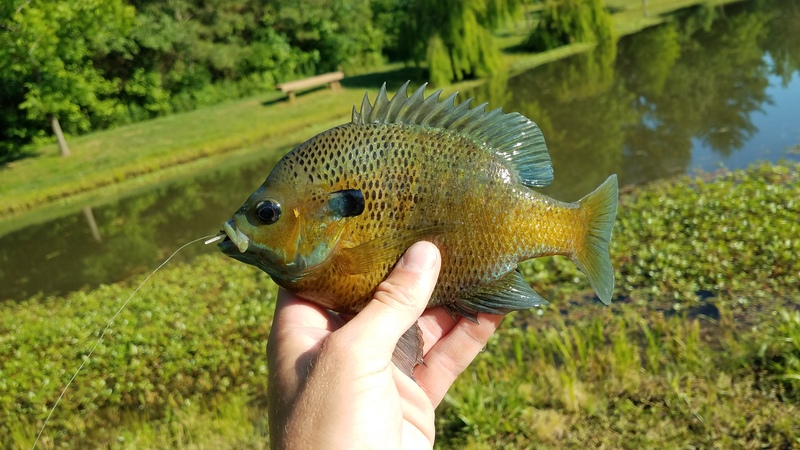 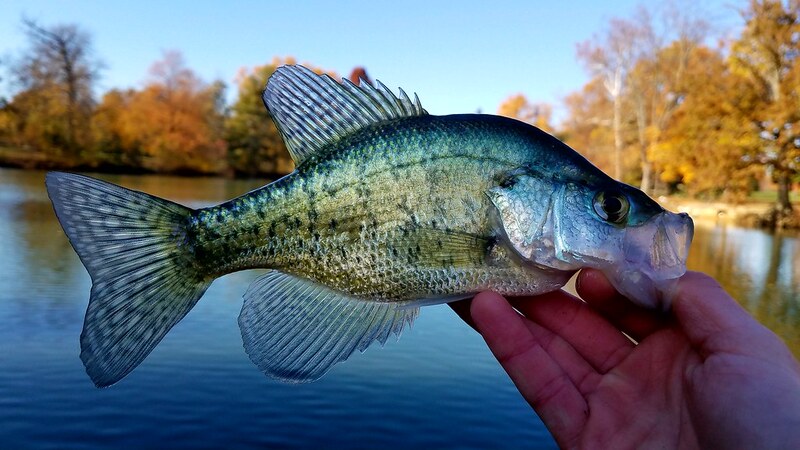 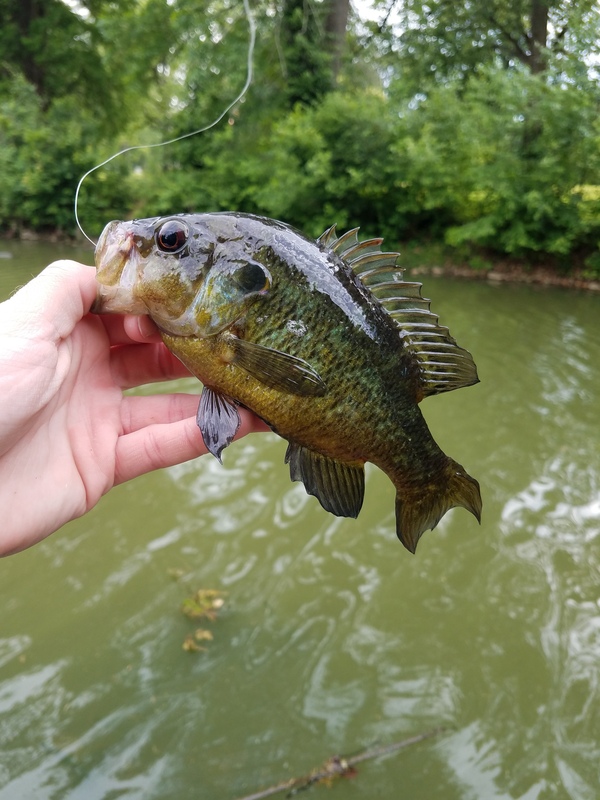 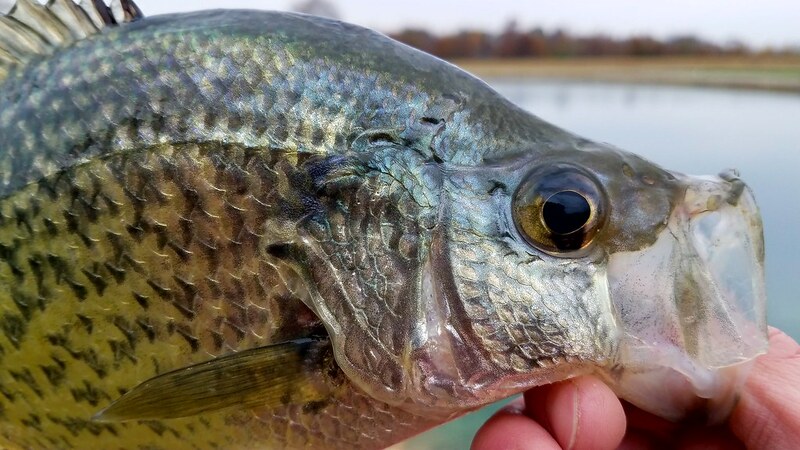 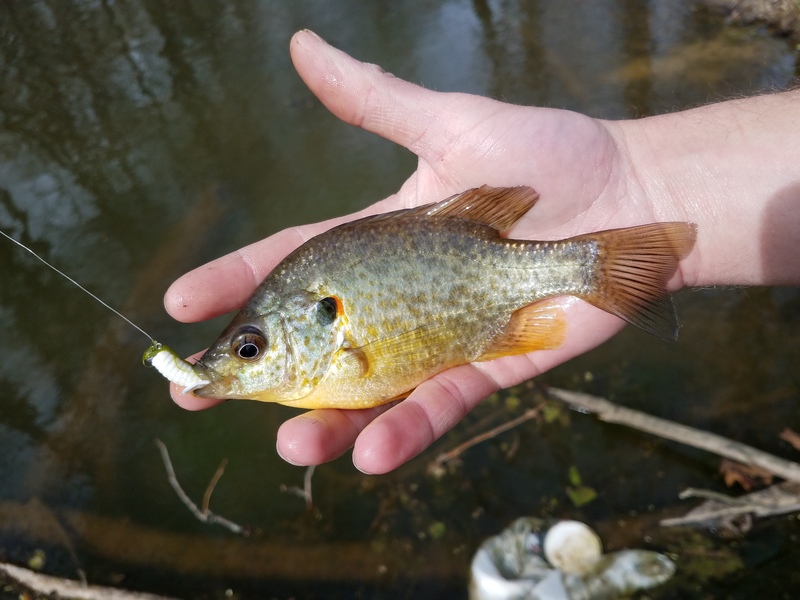 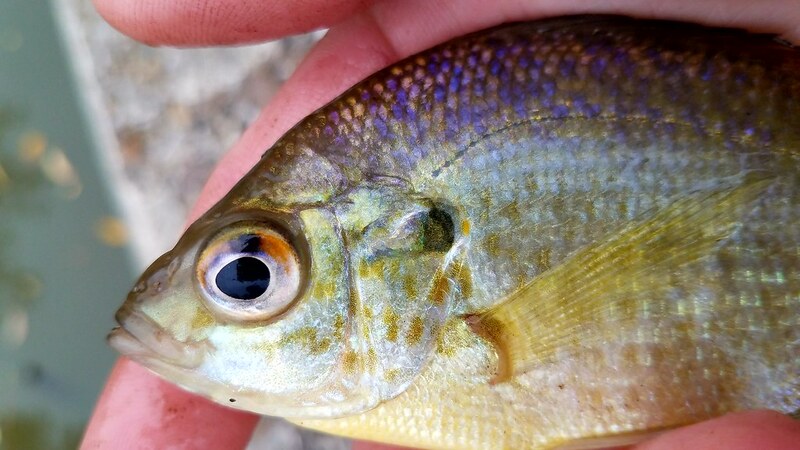 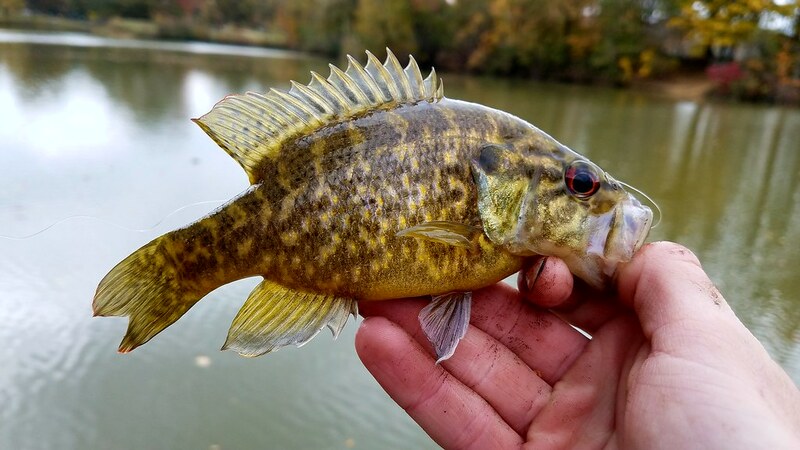 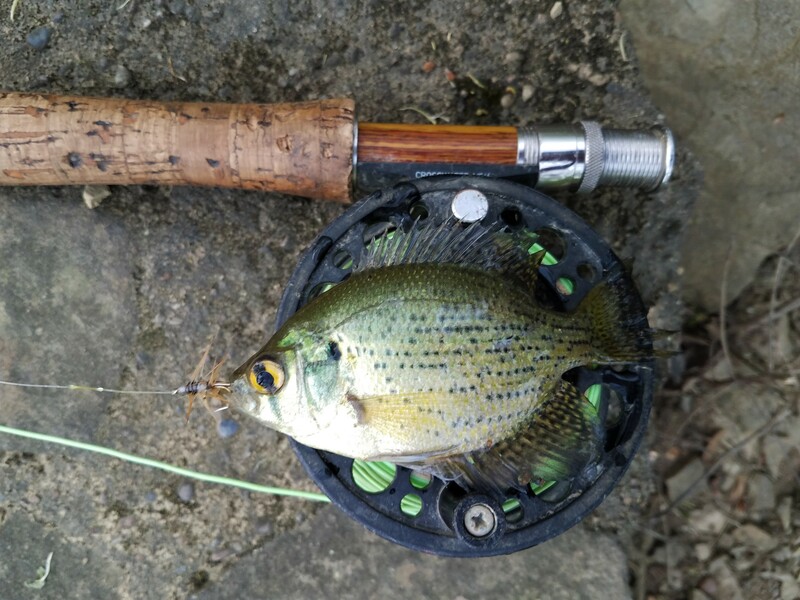 As soon as my bait touched the water an aggressive Longear Sunfish took my worm. 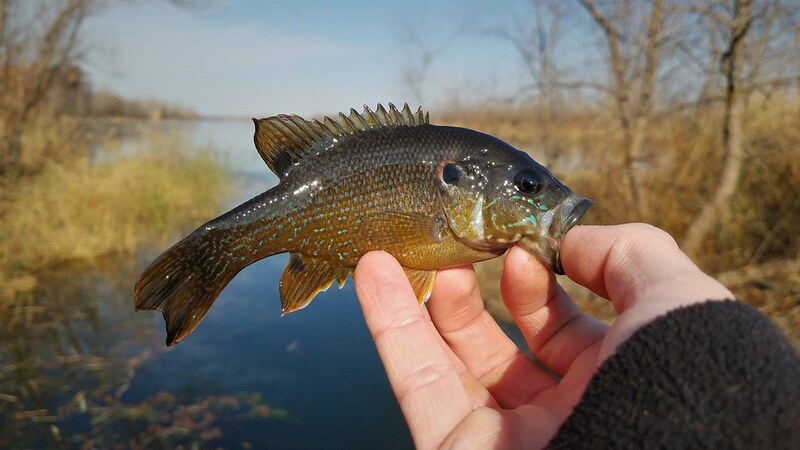 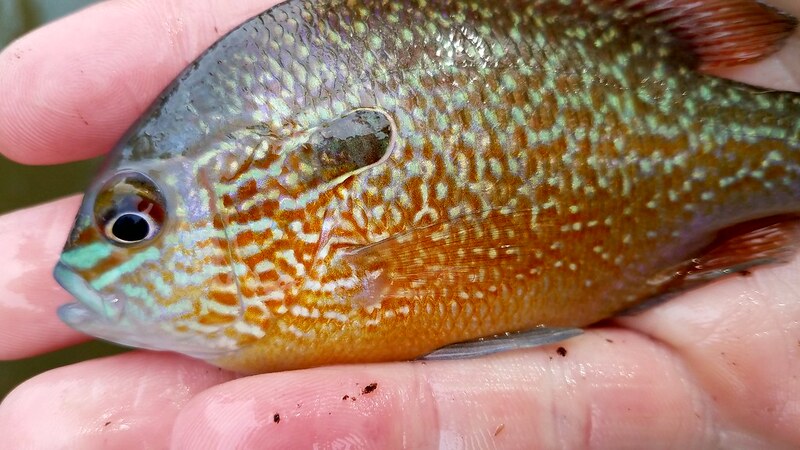 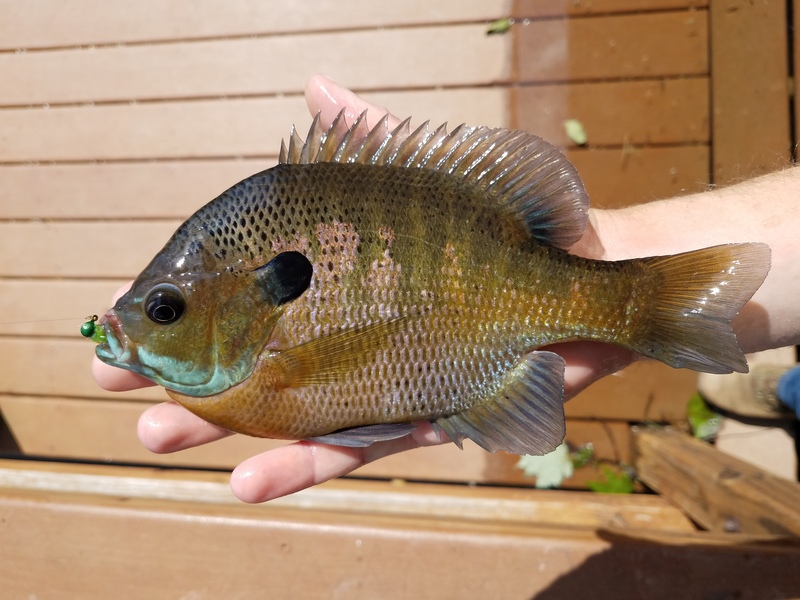 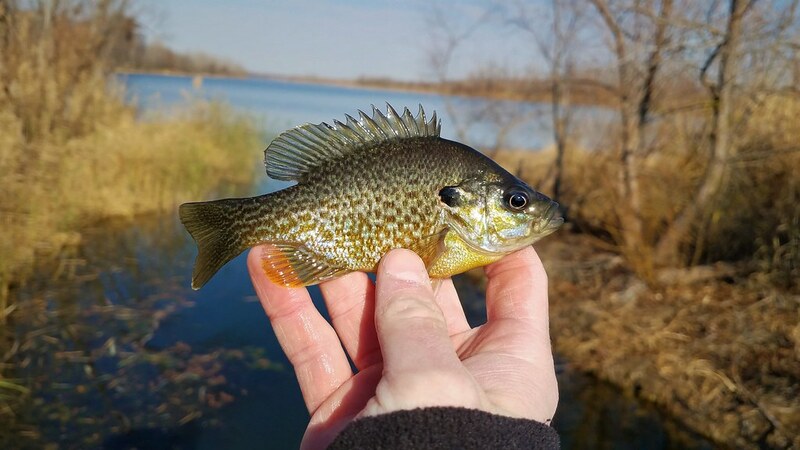 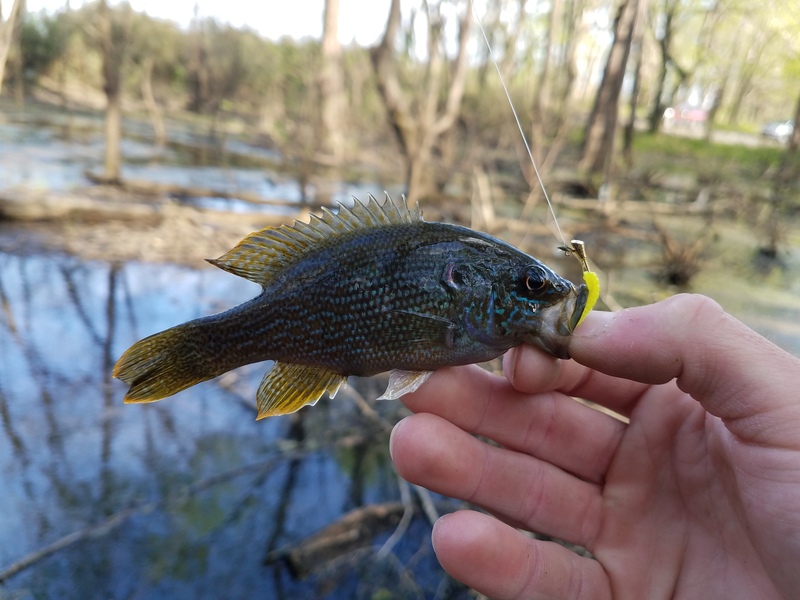 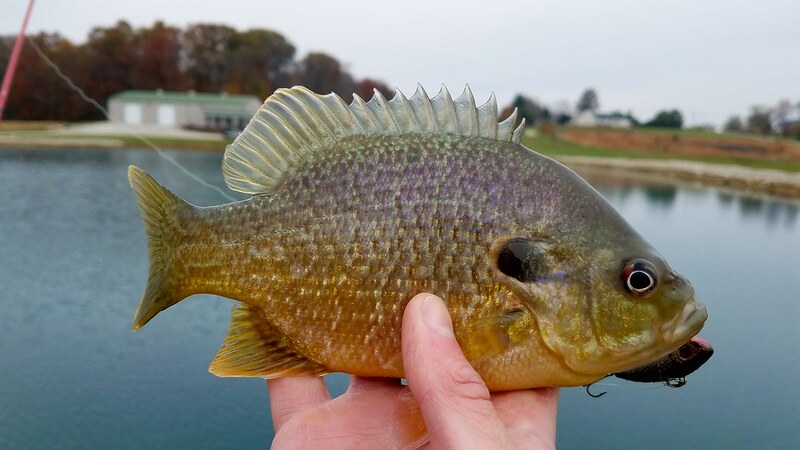 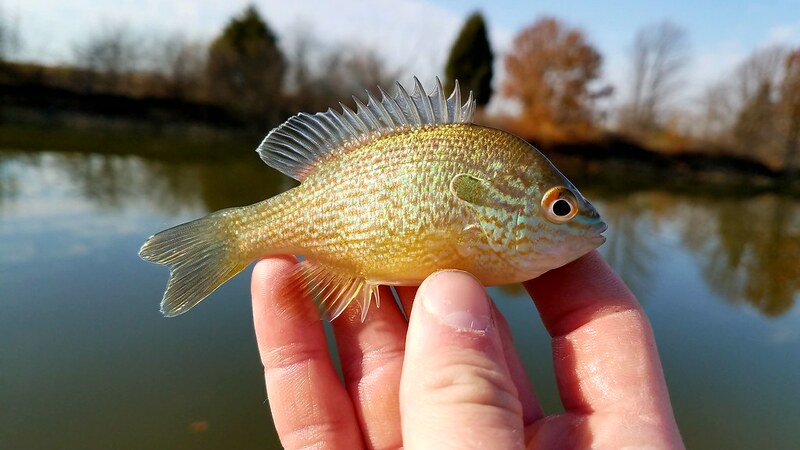 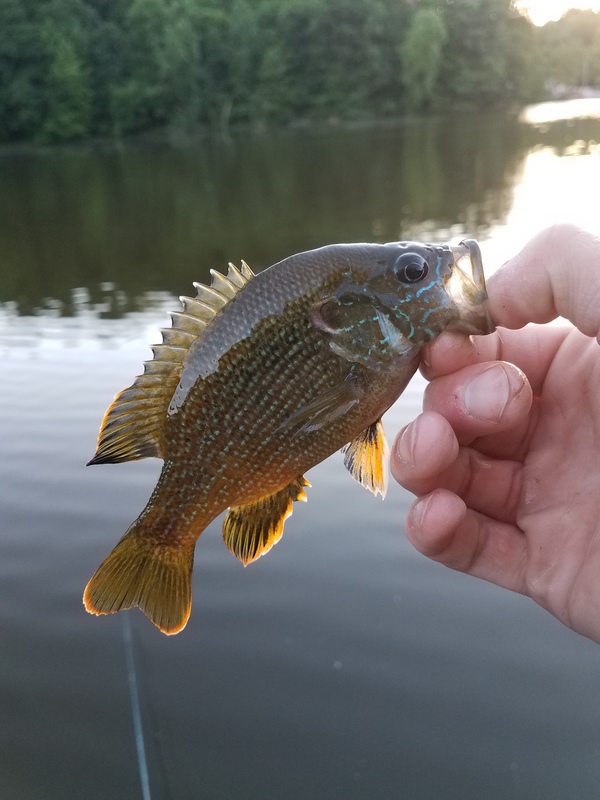 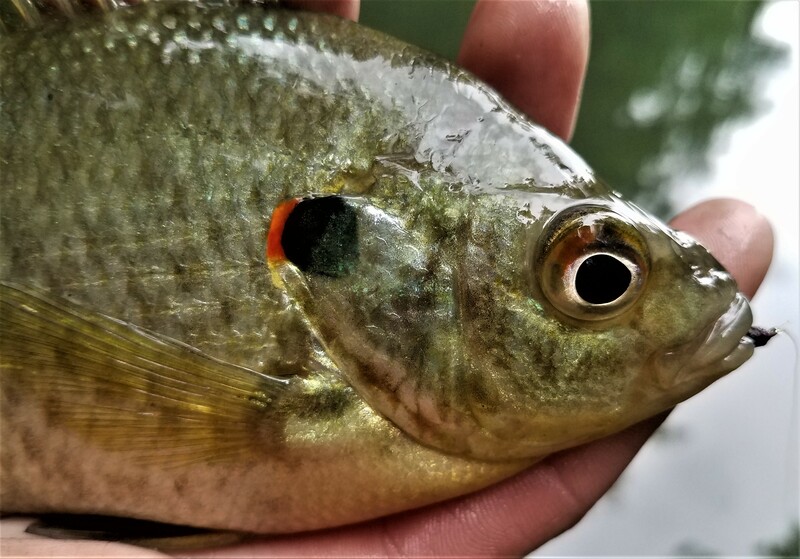 This has to be one of the prettiest Longear Sunfish I have ever caught. 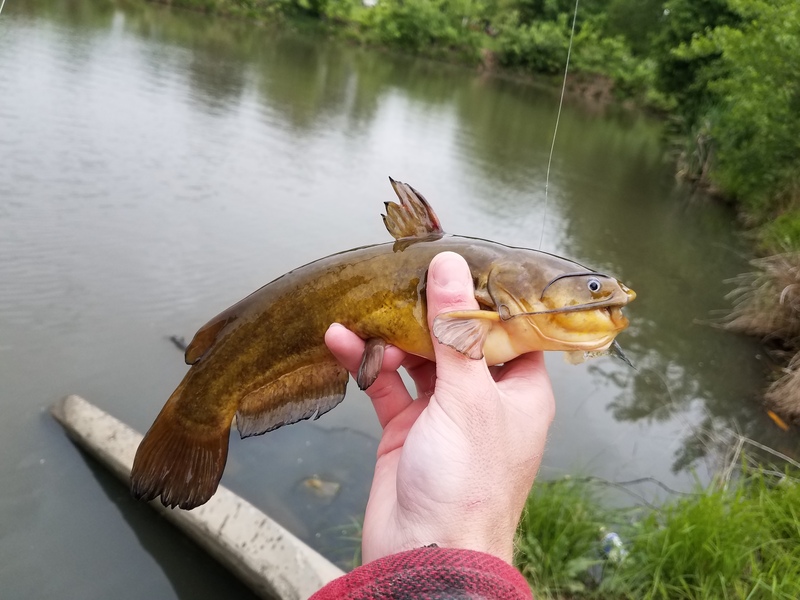 At this point I was simply amazed I hadn’t hooked into any catfish so I moved further downstream to a well known log jam. 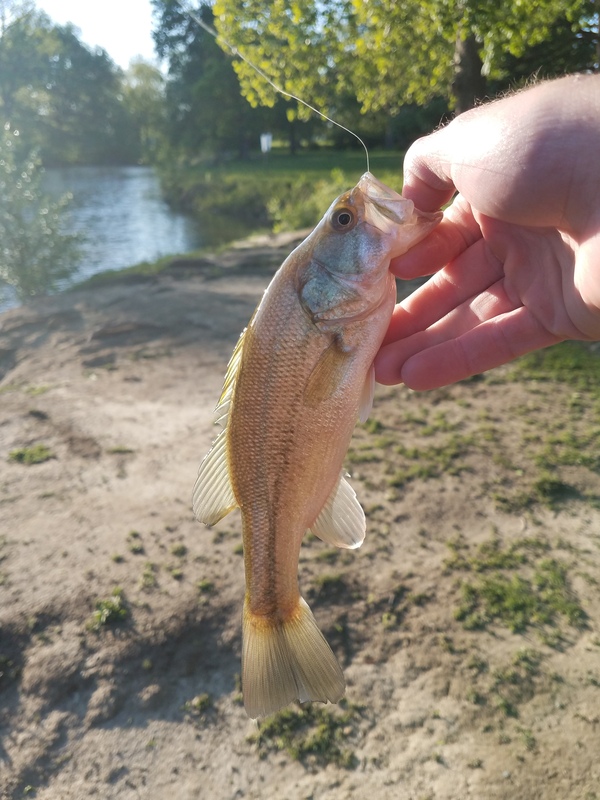 I suspended my bait about a foot above a half ounce sinker and bounced this rig along the bottom with the current. 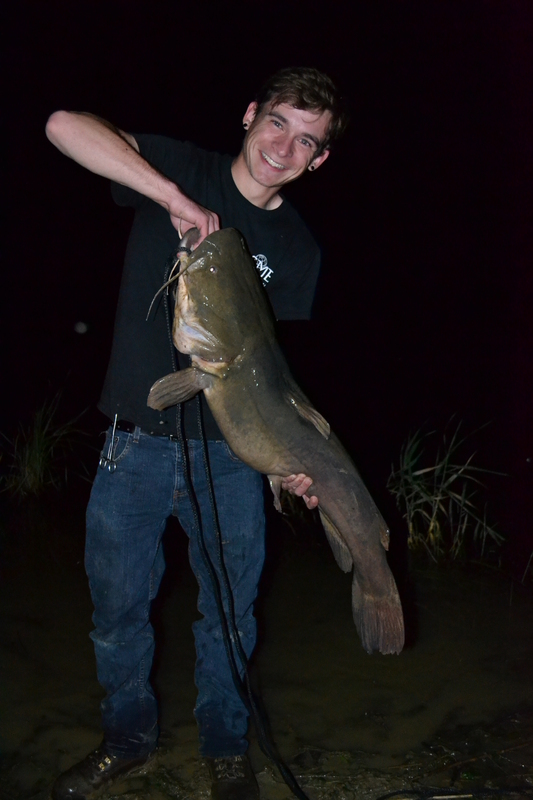 This method quickly enticed a little Channel Catfish. 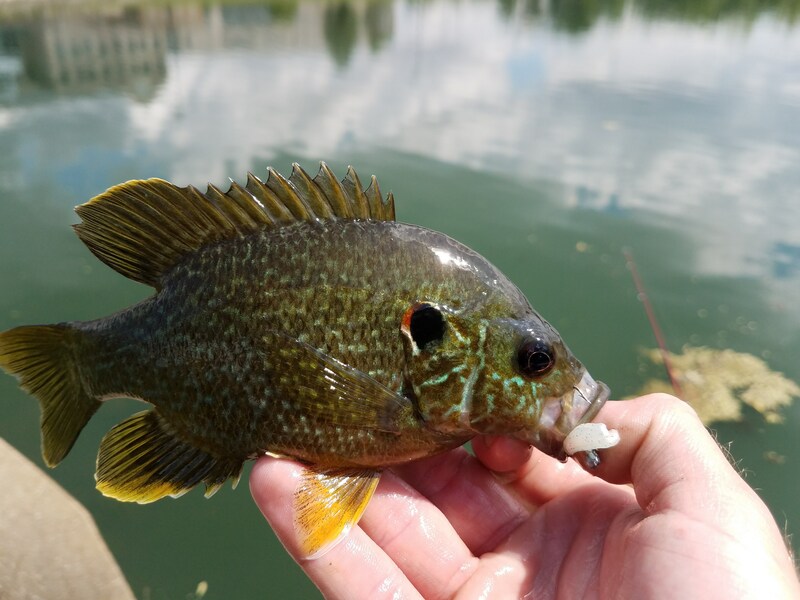 At this point I was mostly out of bait and the temperature was reaching the upper 90’s so I decided to call it quits. 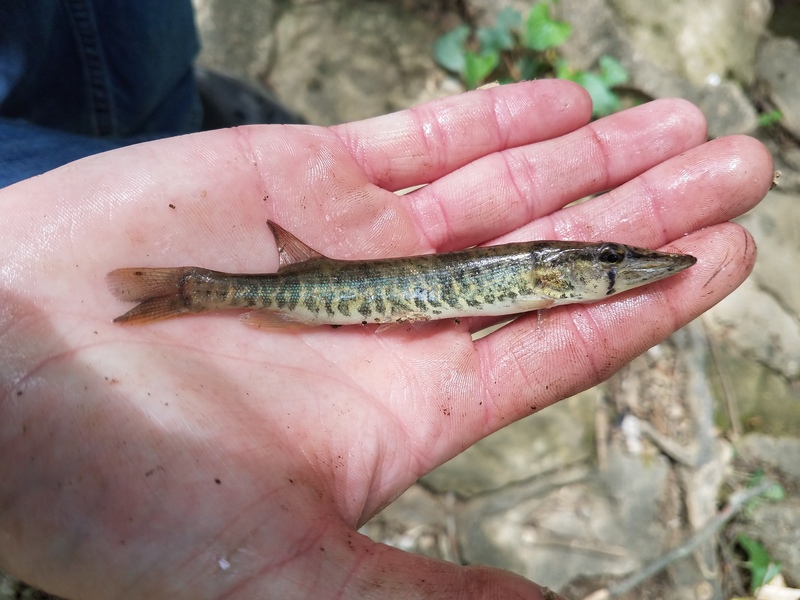 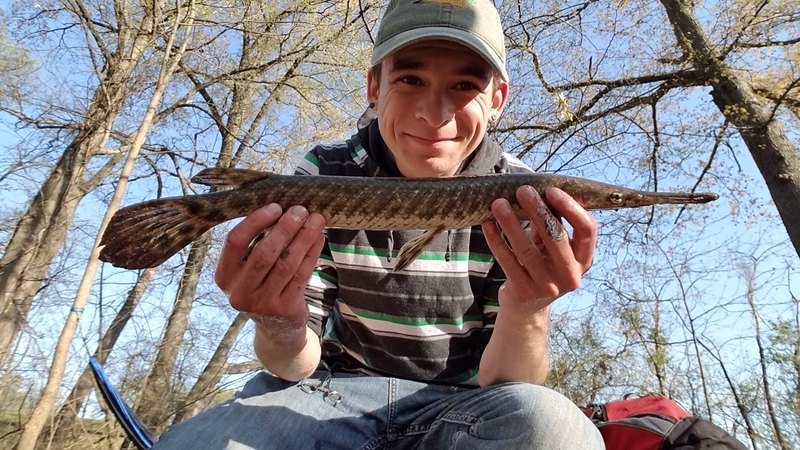 I was proud of all the fish I caught, and I was especially excited to land a gar (it was been a few months since I’ve gotten one all the way to the bank to photograph). 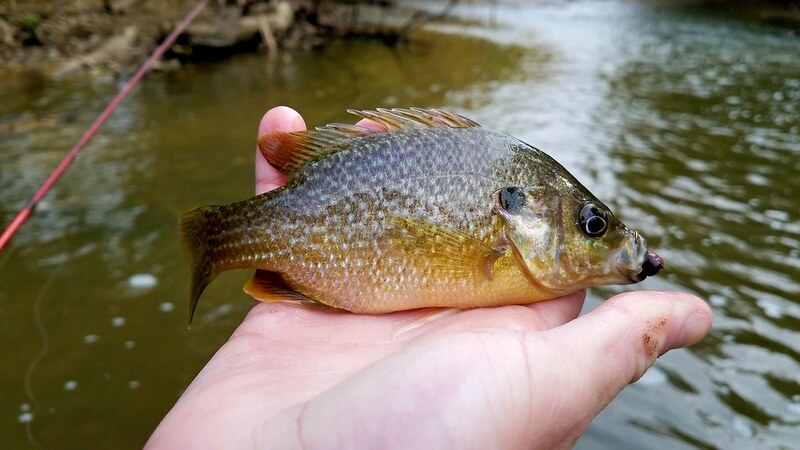 Hopefully I get a chance to fish Pigeon Creek again before the fall leaves make it too difficult to fish. 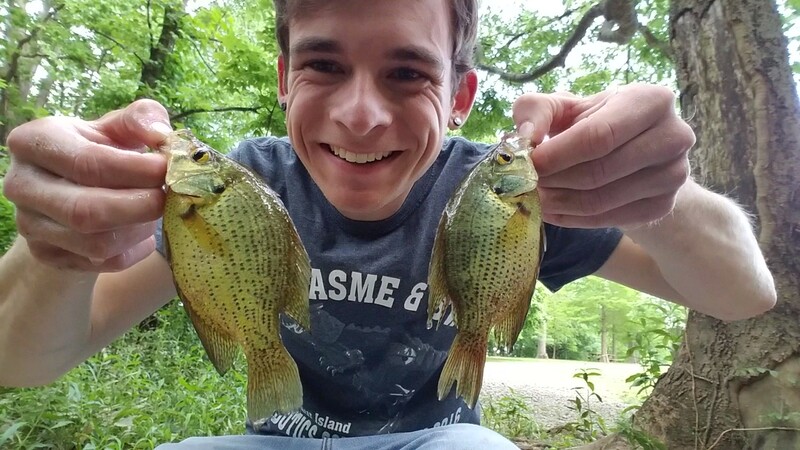 Most of the time when I go fishing I like to make my trips as long as possible, but every now and again life works out to give you just an hour or two to go fishing. 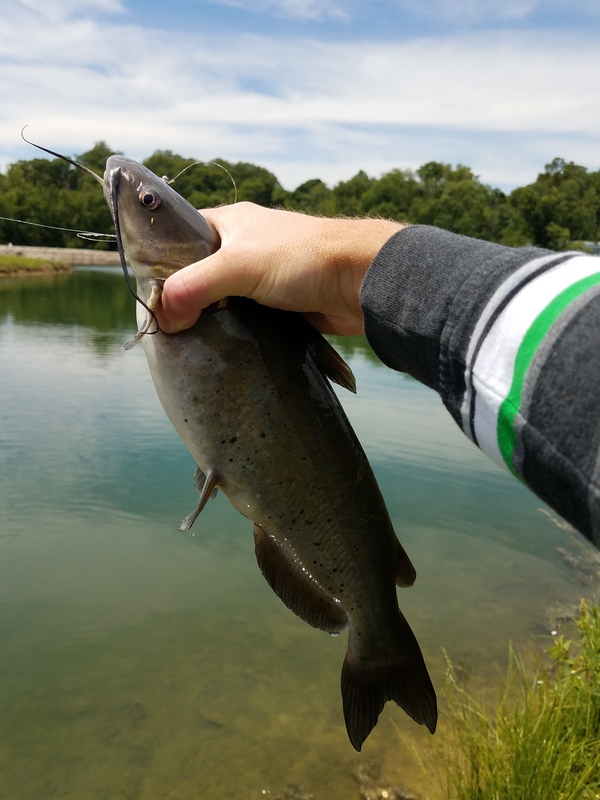 And this has been the case this last week, I ended getting two great sessions in that I had never expected to be able to do. 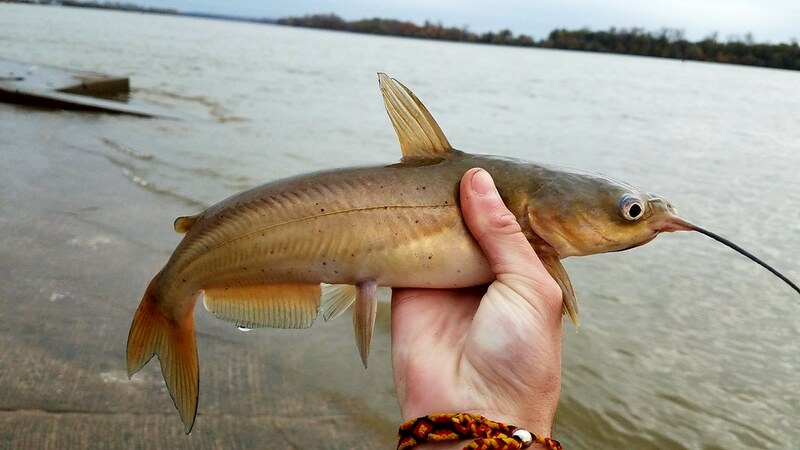 The first session I had was bank fishing on the Ohio River, I set up with the intention of catching as many types of fish as I could. 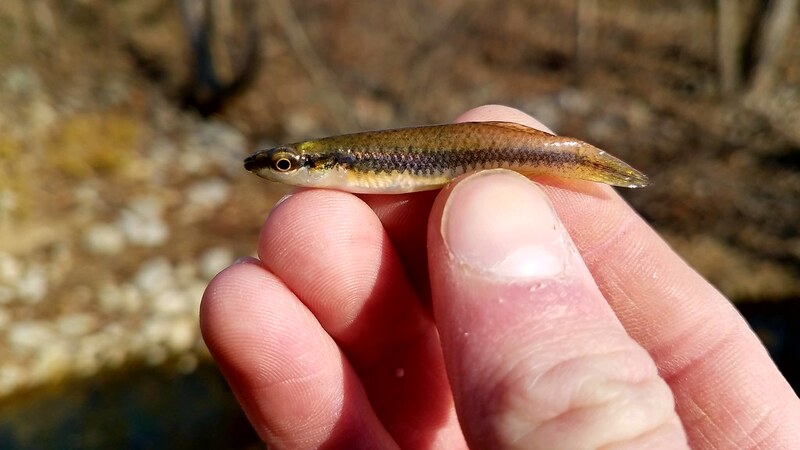 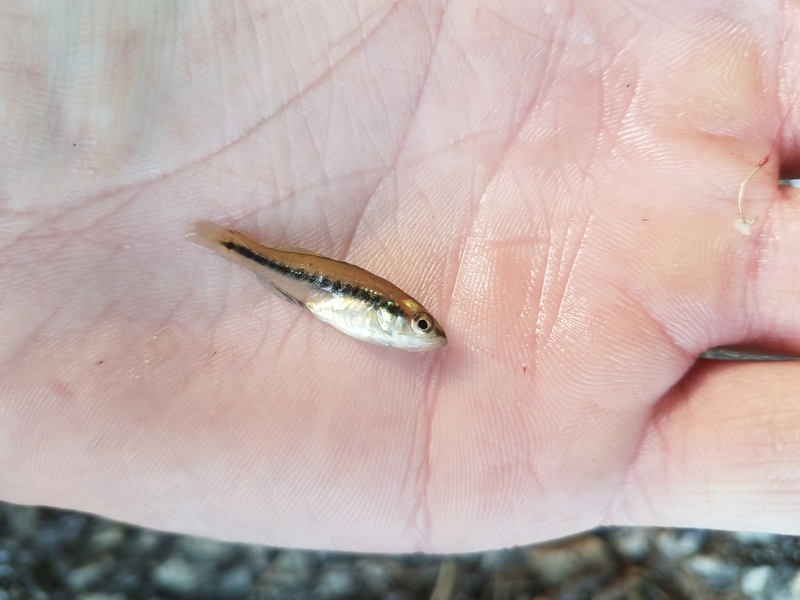 On the drive to the river front I stopped and picked up some nightcrawlers (my preferred spring river bait). 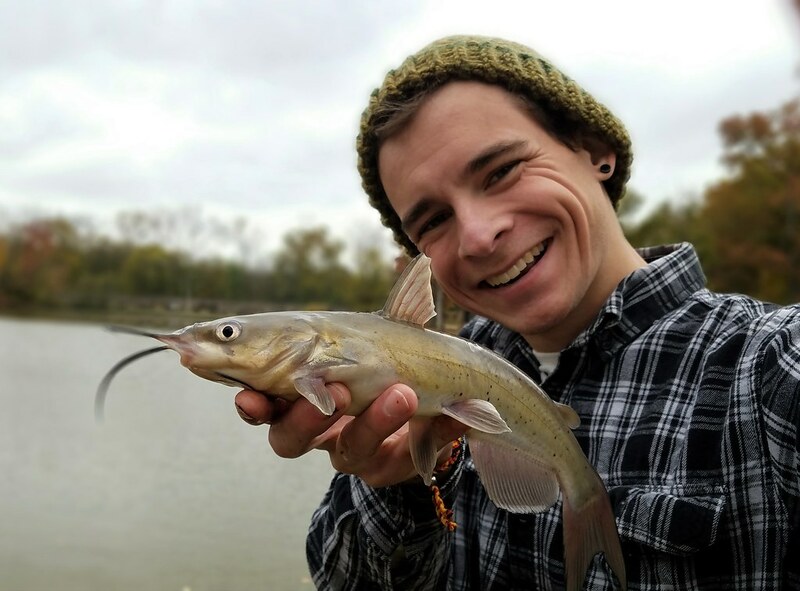 I set up one rod with a modified tight line set up: 1 oz sinker on the bottom, a dropper loop tied off 1 ft above with a 6 inch line to a size 2/0 hook. 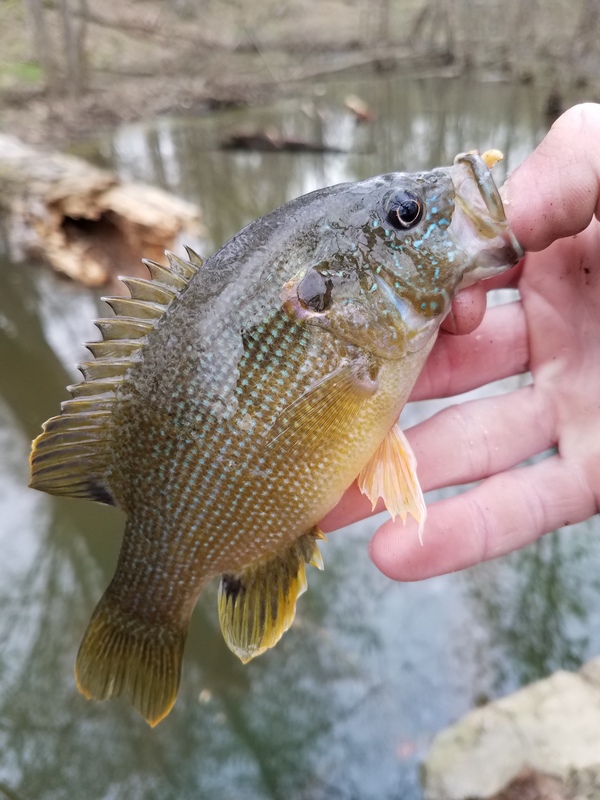 When the river is falling I like to suspend my bait just a few inches off the bottom of the river, I find it catches more fish and you snag your gear in the rocks less often. 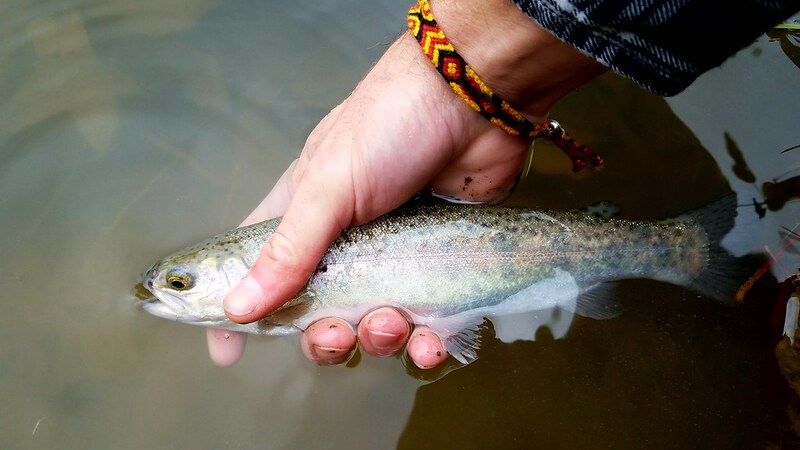 The other rod I tied a size 6 hook on with a few split shots to let it flow with the current. 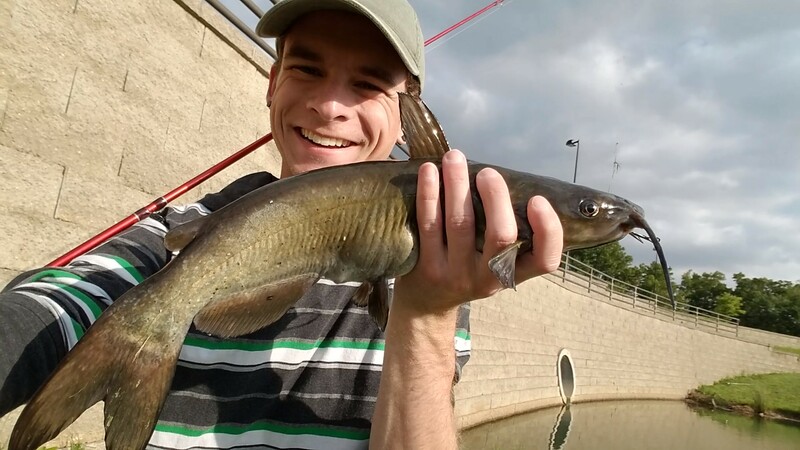 I set up on the back side of a water discharge, this produces a nice deep eddy that constantly holds fish when the water is falling. 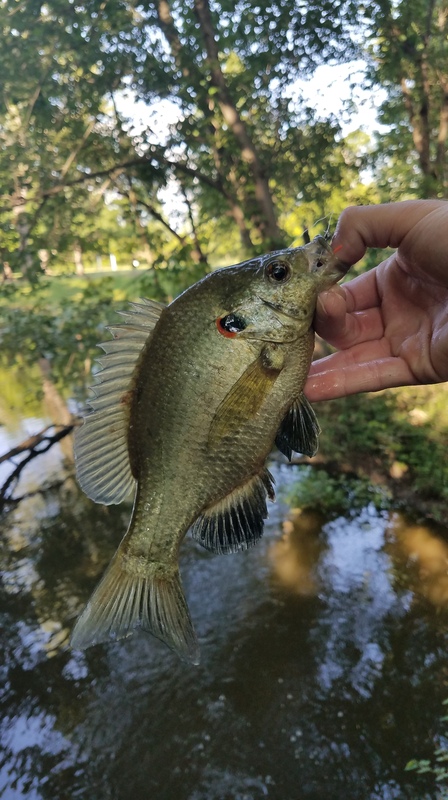 This spot fished just as I hoped, the break from the current held all types of fish and successfully caught 5 different species of fish in an hour and a half session. 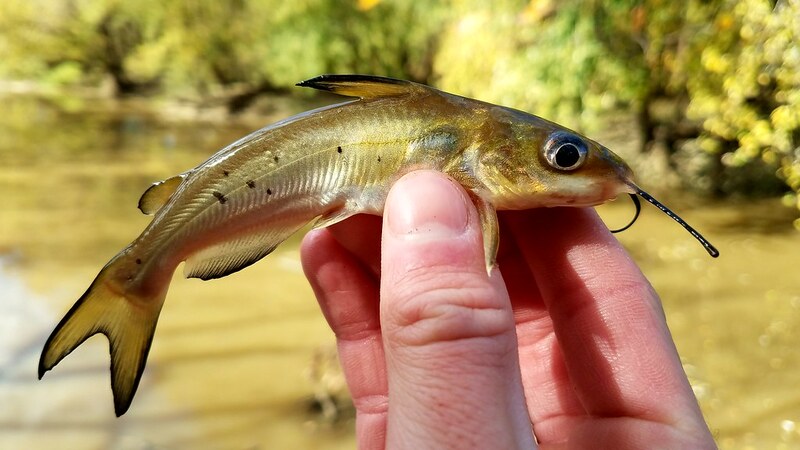 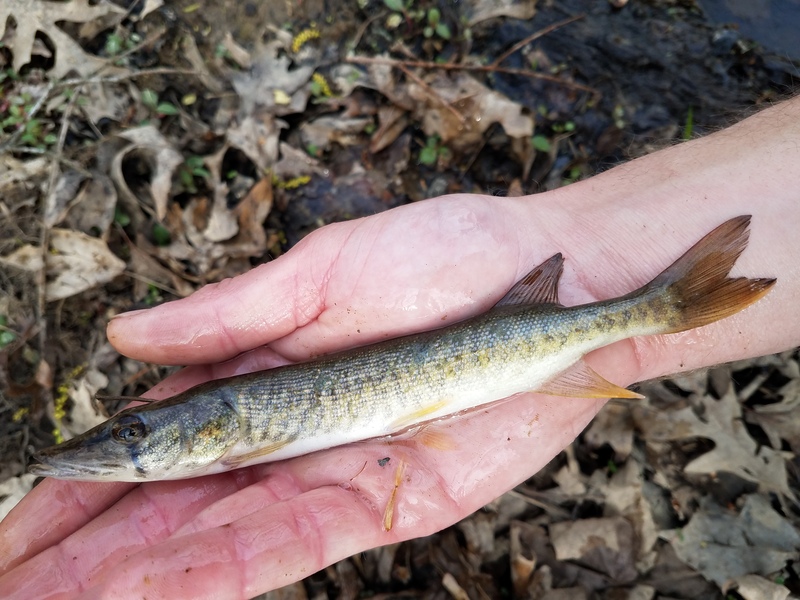 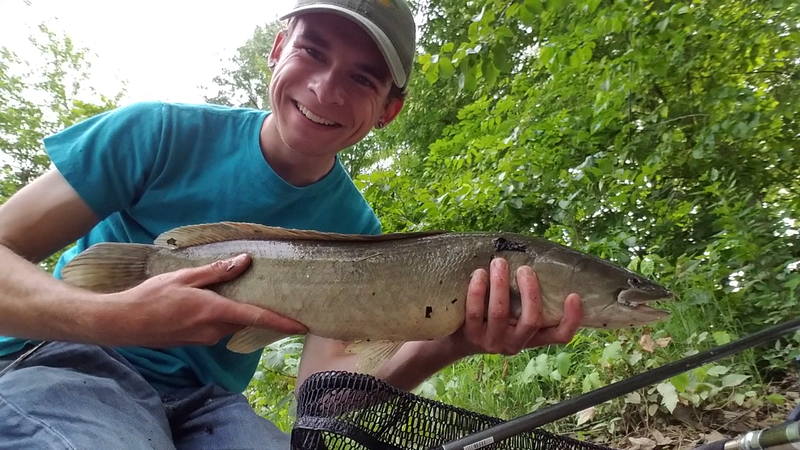 I was incredibly excited to land a few Sauger, they tend to be a very difficult fish to track down from the bank and notoriously difficult to get a hook to hold in. 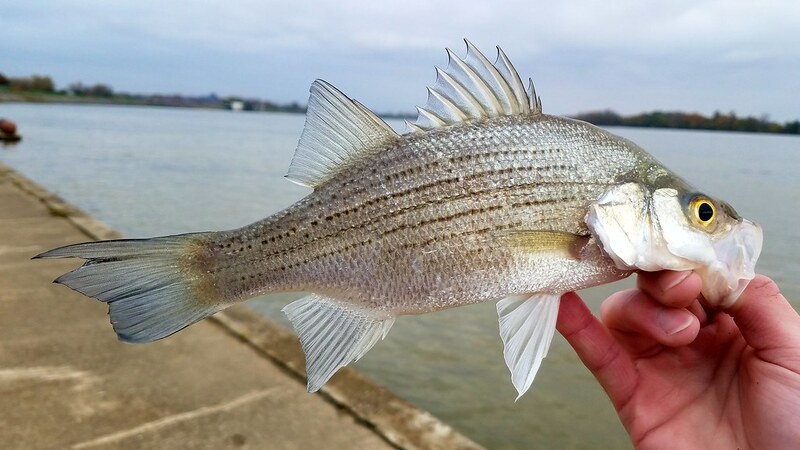 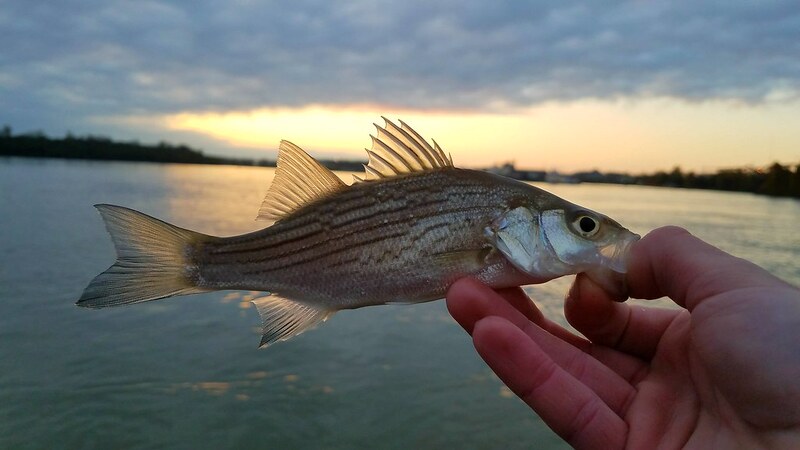 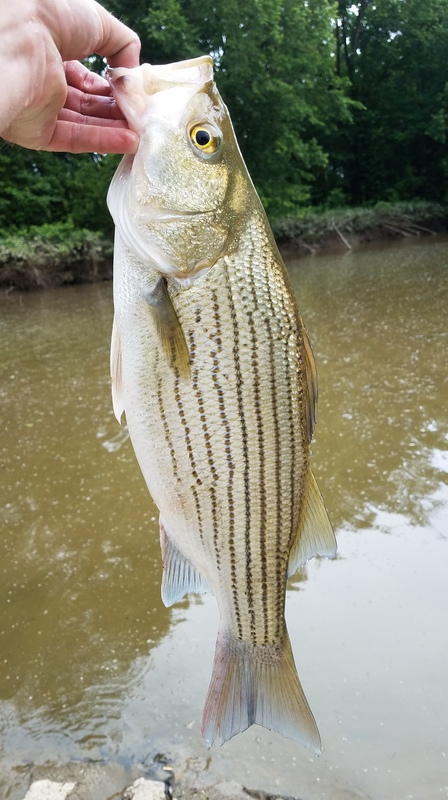 I also caught my first Striped Bass for the year, it seems they started moving up the river earlier than usual this year. 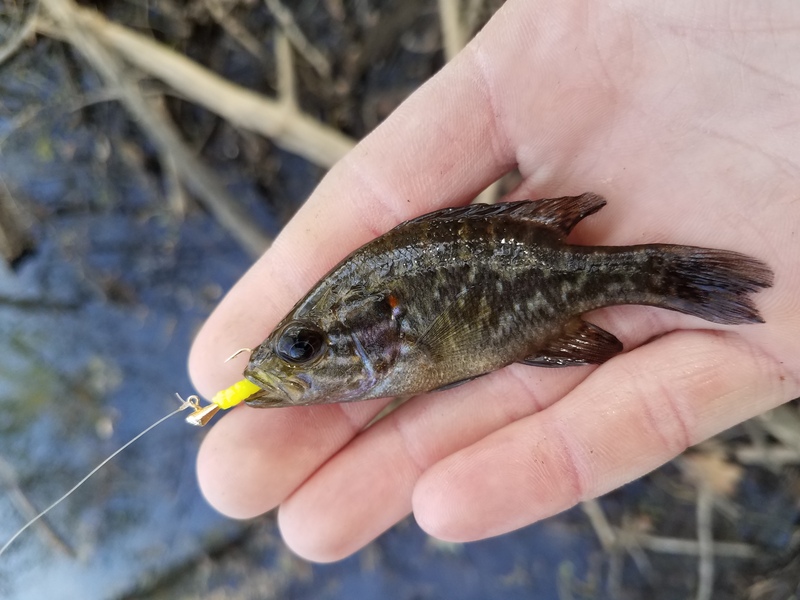 And my absolute favorite was a Smallmouth Buffalo that hit on the suspended worm, these fish give such a hard fight and I have such a hard time finding them in the river usually. 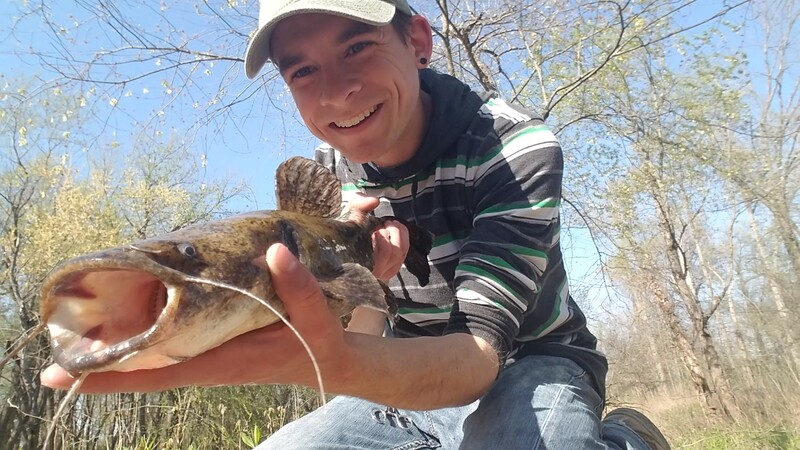 Other than these fish I had a number of small Channel Catfish and Freshwater Drum which are always a fun fight on light line. 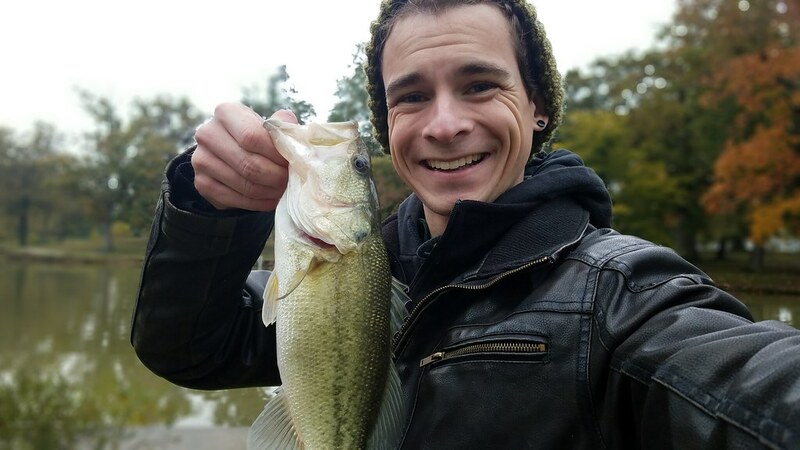 My second session for this week was a happy coincidence, I finished biking with a group of friends and on my drive back I realized there was a public lake at this location. 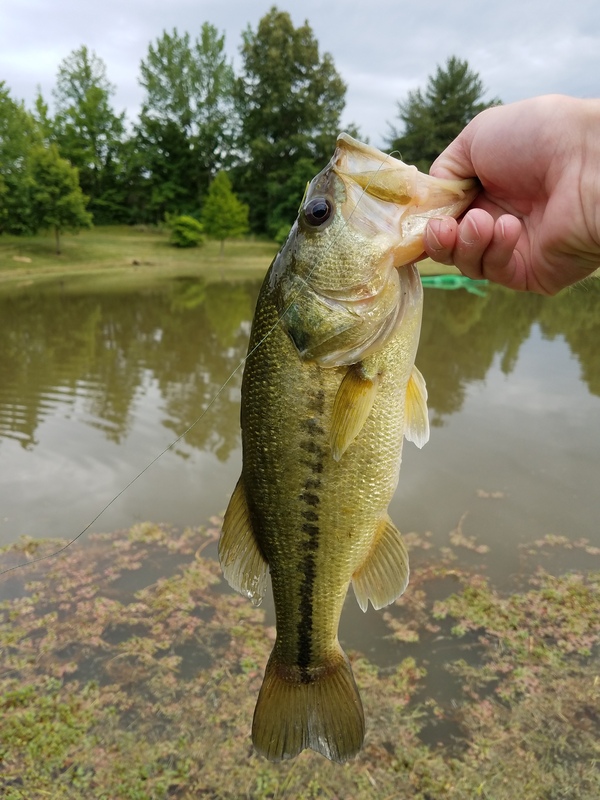 There were some storms starting to roll through, so I figured I would tie on a top water and try to catch a few more fish on the Lunkerhunt Pocket Frog. 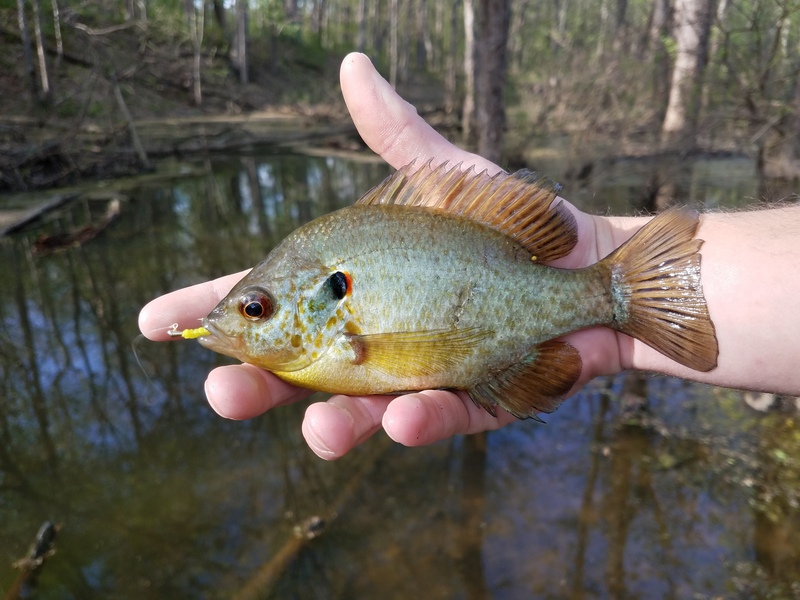 This lure has proven to be one of my most productive lures this spring, so many of these pressured fish have never seen a lure with this natural of an action and don’t hesitate to hit it. 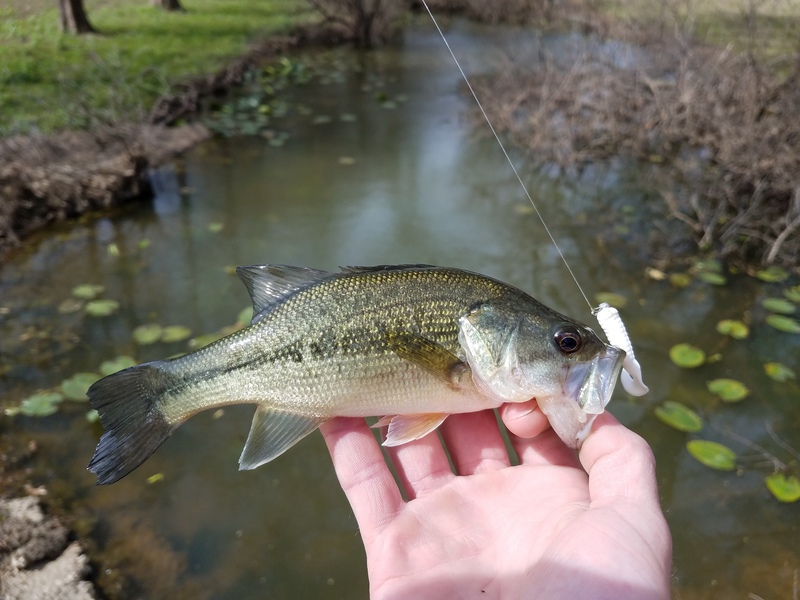 I hooked into 5 little bass and honestly that was about all I expected to catch. 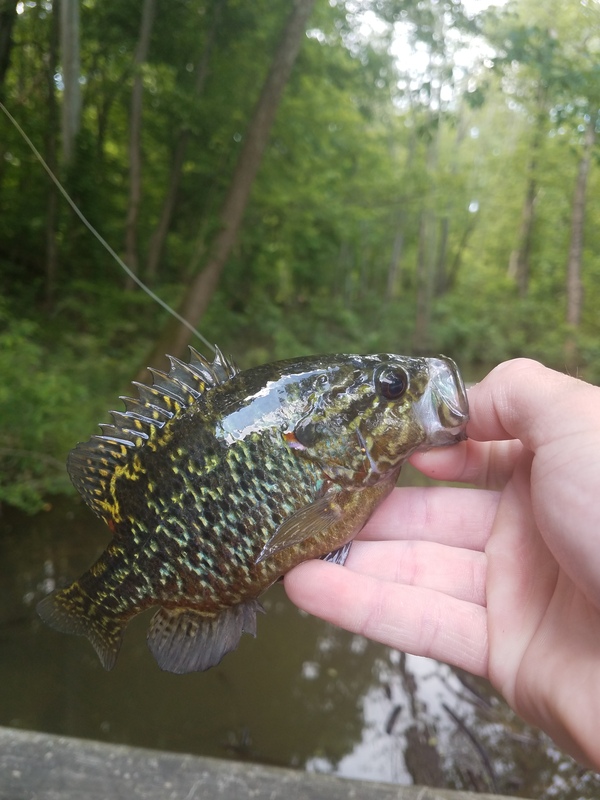 But then as I was working the lure off the other bank and slowly working the deep water in between the banks and fish swam up and popped the lure, but missed the hooks. 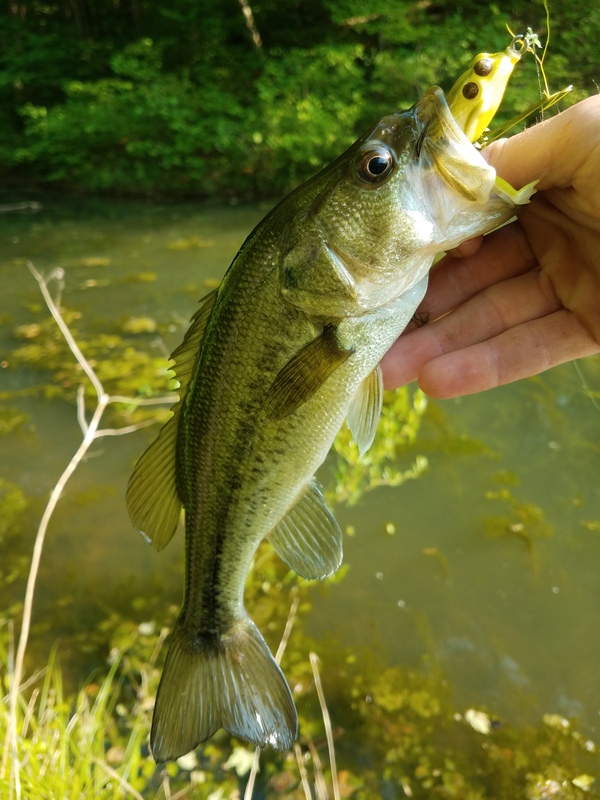 So I gave the frog 2 quick twitches and that fish came right back up and hammered the frog. 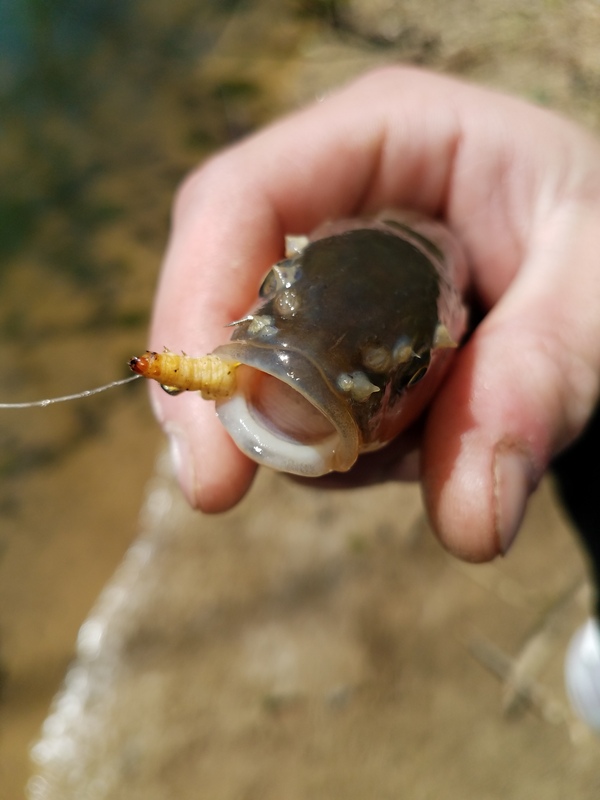 I set the hook hard and was immediately surprised as my drag started peeling out. 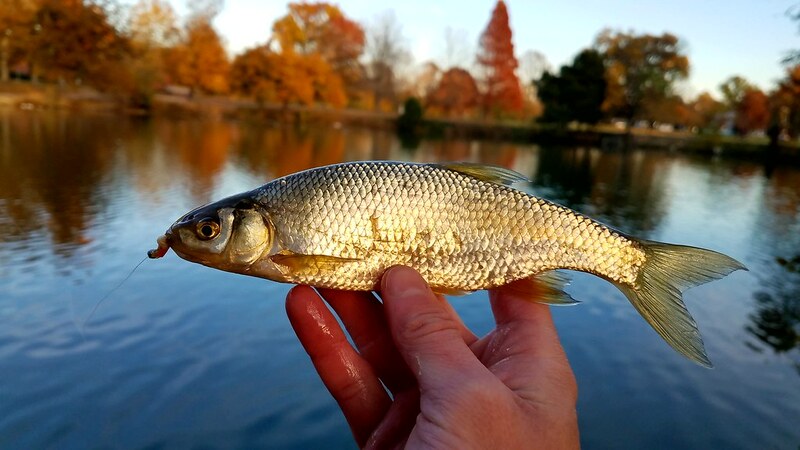 I worked the fish in very carefully to keep it from wrapping up in any of the submerged trees, and then I slipped and fell into the lake…opps. 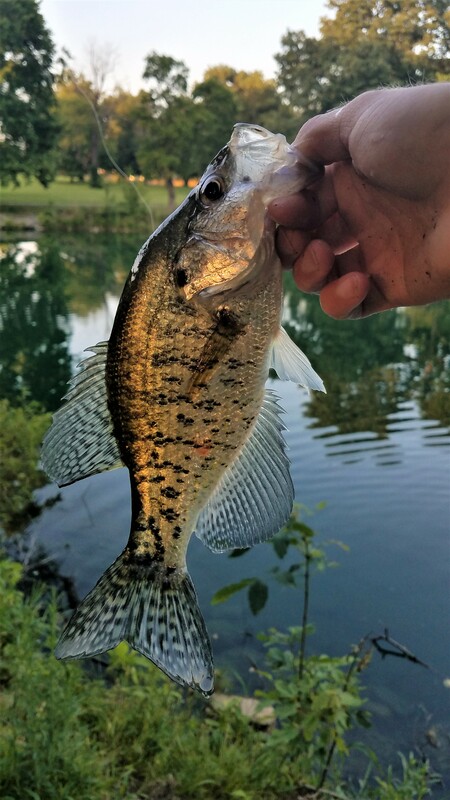 But that was okay, it made landing the fish much easier. 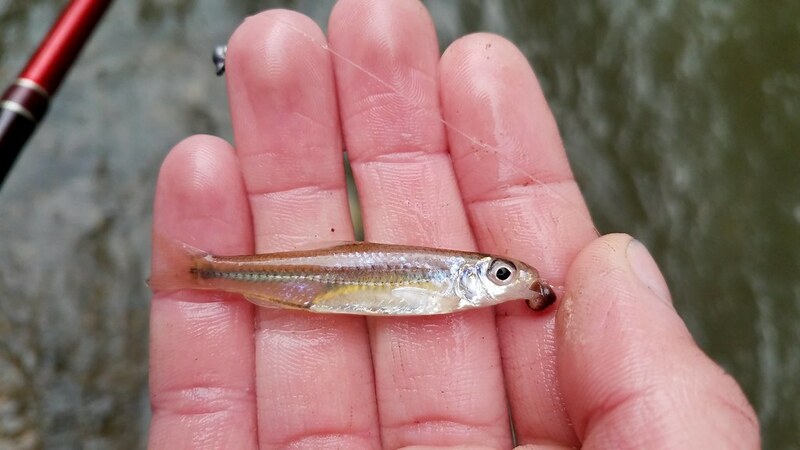 I lipped the fish and carefully crawled back up on the bank. 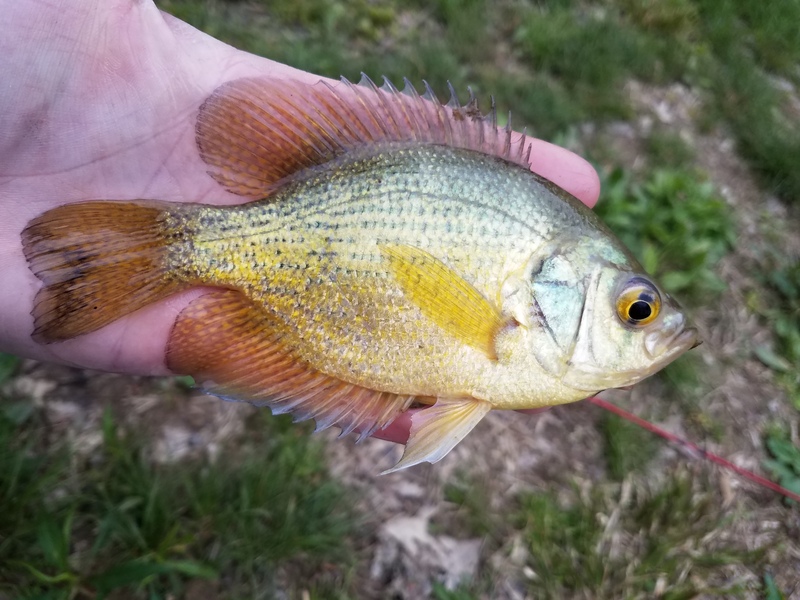 My scale put him at 6 lb and 1 oz. 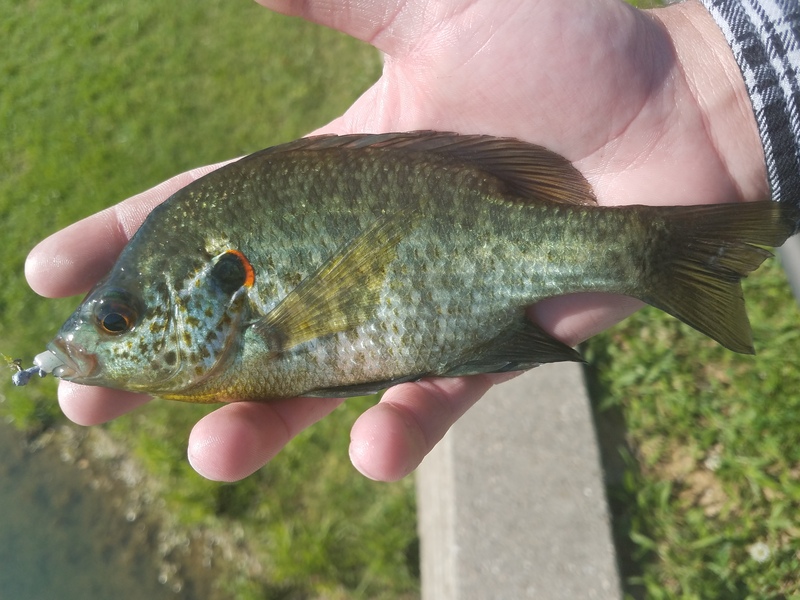 The funny thing is before today I hadn’t caught a fish over 14 inches in this lake. 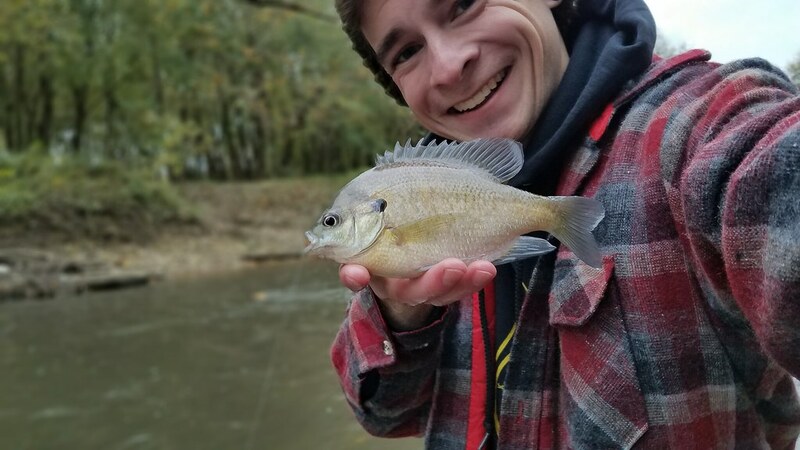 Soon after this fish the rain started pouring down and I made my way back to my car. 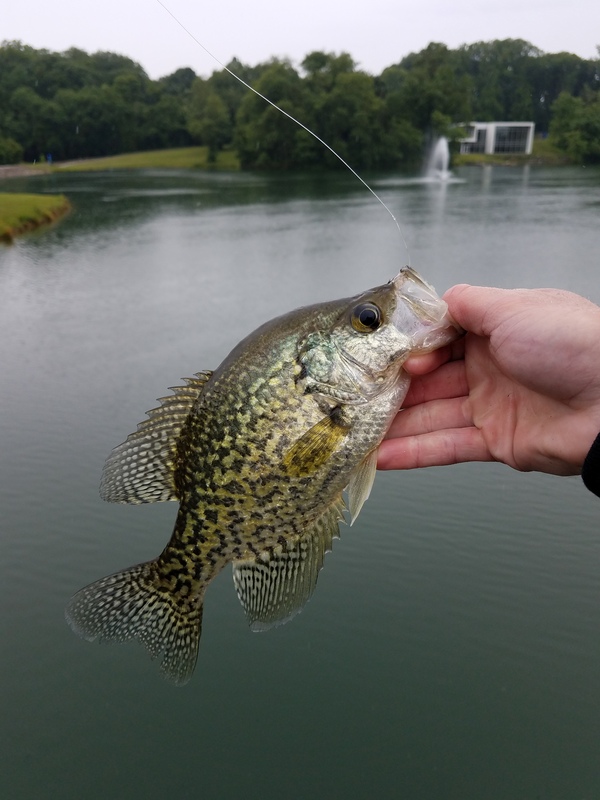 So I guess the lesson from this past week has been to take full advantage of every little chance to fish that you can, because you never know when you will hook something great. 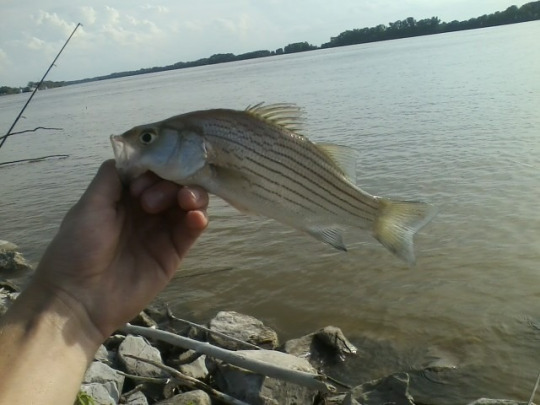 I arrived at the river front at 5 pm to start my fishing adventure. 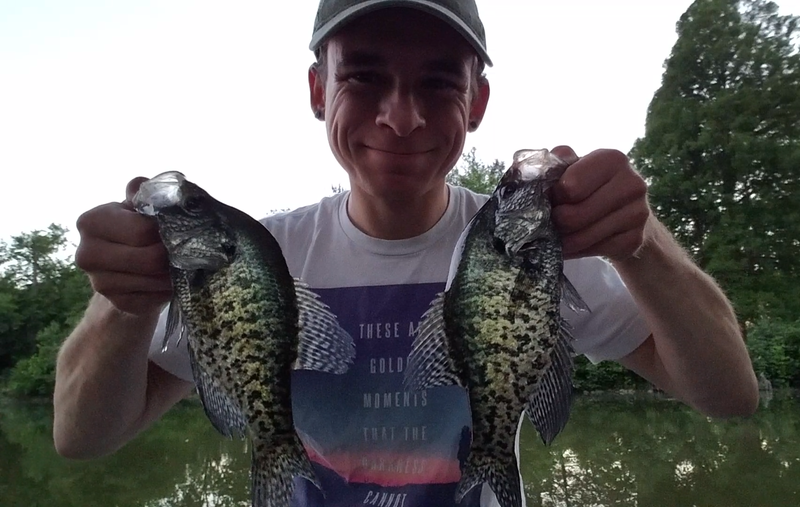 I brought three poles and gizzard shad for bait. 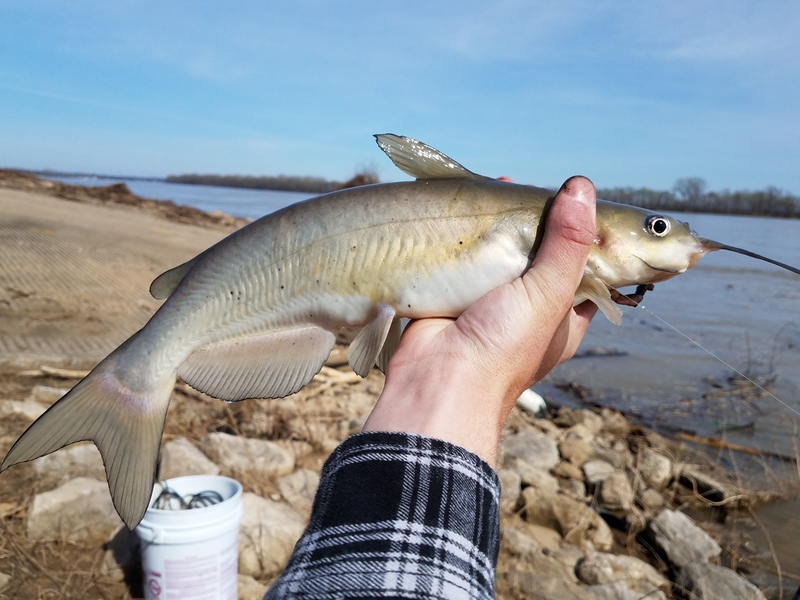 Since the river was at 38 feet (as opposed to the normal 24 this time of year) and it was still on the rise I decided to work the bank as close as possible. 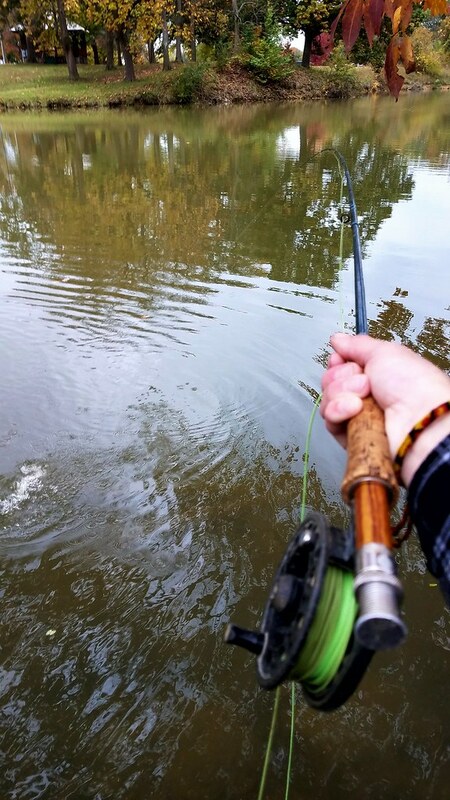 I set two lines suspended and on line right on the bottom each cast out 5-10 feet. 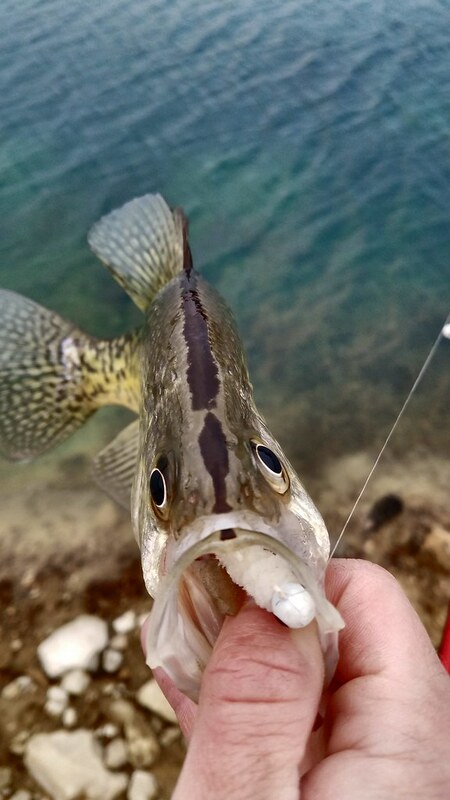 Unfortunately I was unable to find any good structure or any decent current breaks. 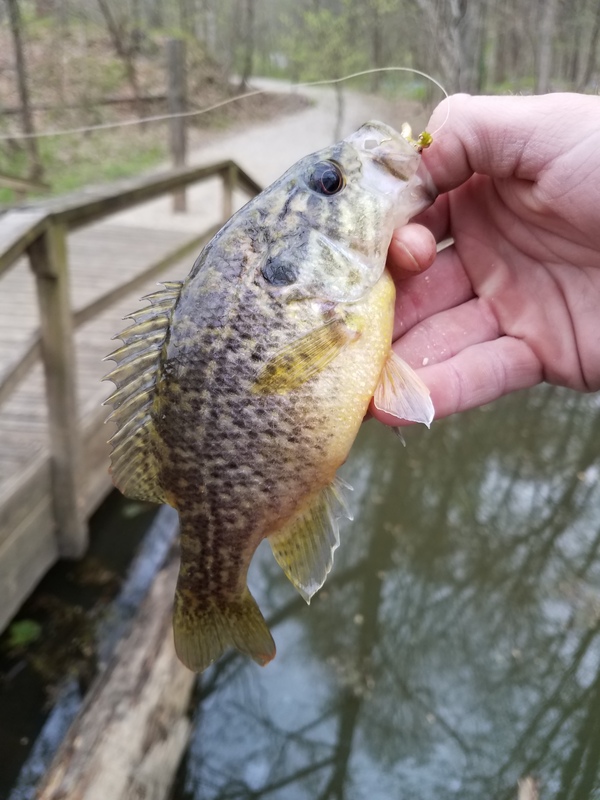 After about two hours I had my first and only hit and reeled in a small hybrid. 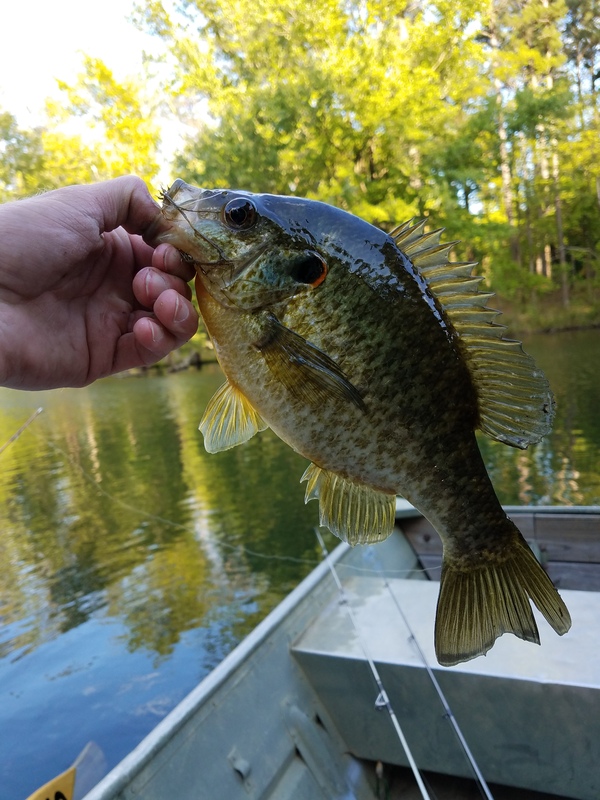 While it was nice to catch a fish, the trip was much slower than I expected. 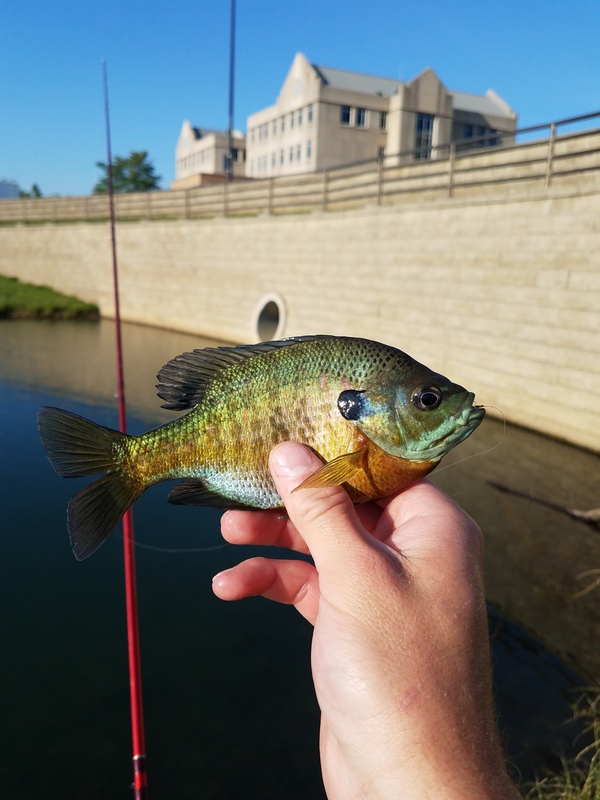 I did learn that not as many fish cruise the edges of the bank as I had expected, so until the Ohio drops I’ll be fishing much further out.